This was a question asked by my therapist during what will likely be my last session for a while. Getting a “normal” (a word she is sure never to use) job is tempting sometimes. A normal job would provide more financial stability, that’s for sure. 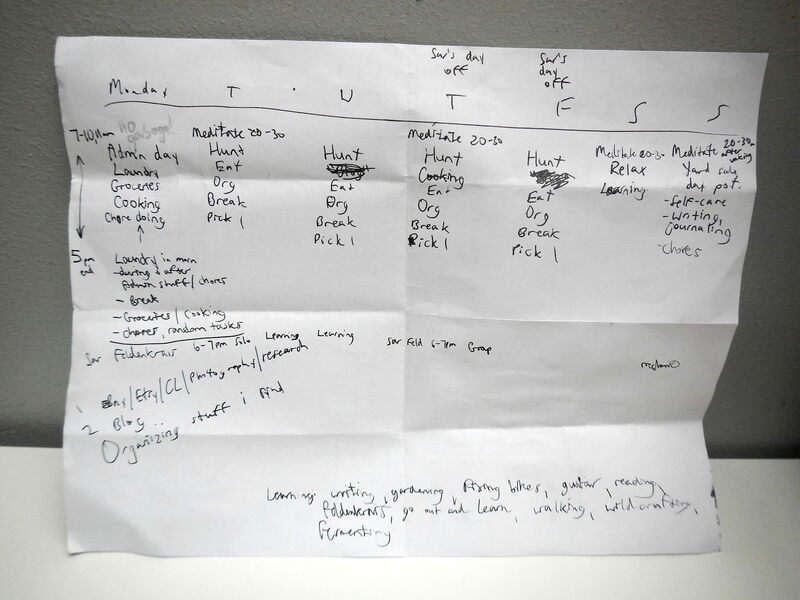 However, the most attractive aspect of traditional work for me is the set schedule. You get up, go to work, do whatever it is you’re supposed to do, and then go home and think about something other than work (though this is getting harder in the age of smartphones). By working you give up a bit of freedom but you gain comfort, a fair trade-off in many cases if you ask me. As a full-time, self-employed scavenger I have all kinds of freedom. I can take days off whenever I want and I don’t have to report to a boss. I enjoy most of the tasks related to my work and choose to do them completely from my own free will. The only problem is that I’m really bad at turning “off.” My brain has always tended toward over-analyzing and self-doubt and it (especially recently) results in constant internal questioning. Should I go on a hunt in the morning or should I spend the day getting things on Ebay? Should I be on Ebay right now or should I try to relax? Should I be relaxing right now or should I be researching my finds? The constant internal dialogue is exhausting and often leads to a state of analysis paralysis where I achieve none of my desired goals. I think of myself as an accidental workaholic, one who satisfies the definition not through a compulsion to work but instead the sheer power of neuroticism. This all takes energy away from other aspects of my life. Cooking, for example used to be something I enjoyed doing but now rarely get around to. It feels overwhelming to think about planning a meal, buying groceries, and then cooking that meal while other work waits. As a result I rely too much on eating out which isn’t good for my health. I also feel too busy to commit to classes, workshops or cultural events that might help me learn new skills or discover new ways of thinking. I think the solution is to better schedule my life. I’ve spent a lot of time with my therapist and friends discussing various strategies, the most recent of which is the quite strict but also very freeing. It’s characterized by how it delineates “free time,” forcing me to take a break around lunch and be done with work entirely – no Ebay, no research, no hunting, no nothing! – at 5pm. I also have Saturday completely off. Having this free time scheduled is both exciting and terrifying. What will I do with all this extra time? Is “turning off” something I’m even capable of? While these thoughts pop up I’m mostly optimistic that this schedule will help make life a little less chaotic. On Thursday I did a run through Westmount and Verdun. It was a grungy day where it felt like everything I looked at was oily, grimy or smelled like cigarettes. The pile above smelled like cigarettes. Everything was inside those really cheap black garbage bags that will rip at the slightest touch. There were some interesting old things and I proceeded in spite of the smell. 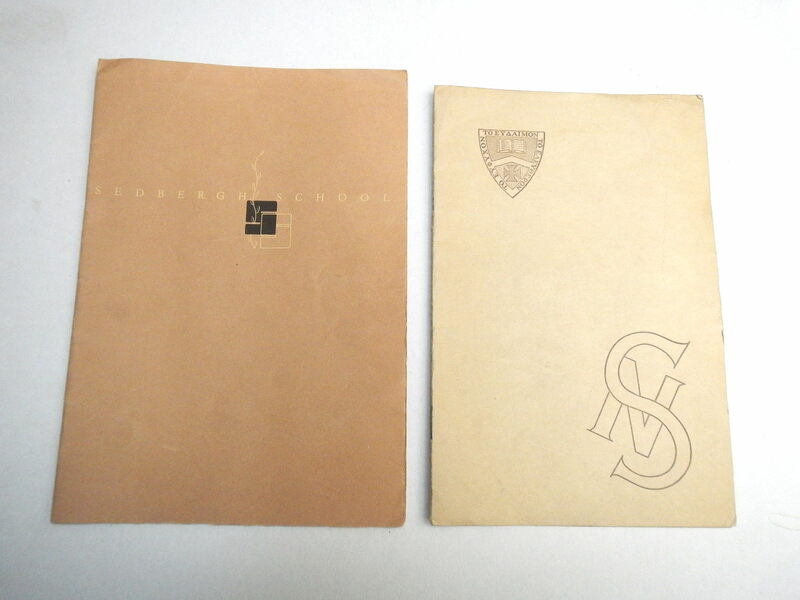 These are two old publications by the Sedbergh School, a private senior school in Montebello (a cute town an hour from Montreal) that was open from 1939 to 2010. On the left is a promotional pamphlet from early 1939 trying to encourage people to visit and enrol their children. On the right is a “Sedburgh News” student publication from June 1950. 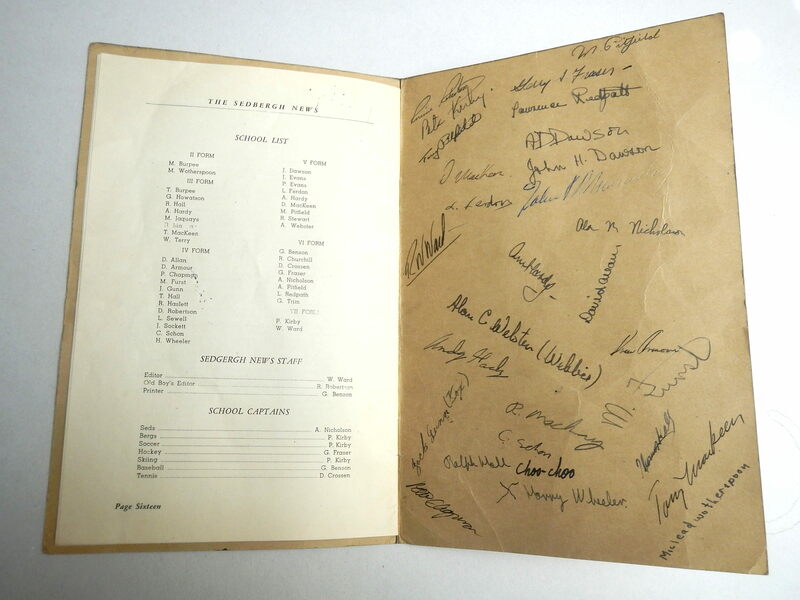 It seems to have doubled for a yearbook as whoever owned this got his classmates to sign the back. I thought it would be a good idea to do some research and see if any of these signatures belonged to anyone famous. This process turned out to be fairly easy – Wikipedia has a section of “notable alumni” in their Sedburgh School Wikipedia page. It turns out that two of these people are notable enough to have their own Wikipedia page. One is Pete Kirby (signature at top left) who won a gold medal in Bobsleigh at the 1964 Olympics before becoming a geologist. The other is Michael Pitfield, a long-time Clerk of the Privy Council (highest level civil servant) and Canadian Senator from 1982-2010. 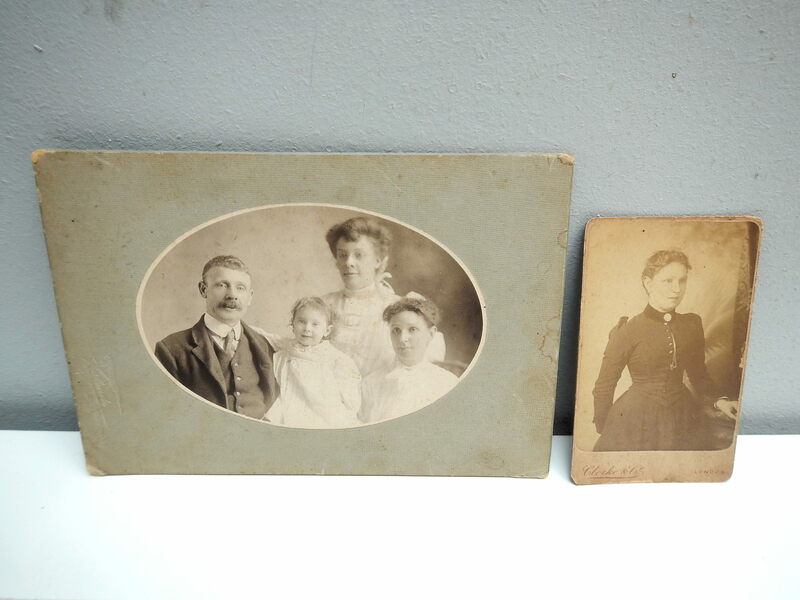 Deeper in the pile were two old photos from the late 1800s – early 1900s. I find it a bit odd that I would find these but no other photos. I also saved a few old tins. The one in the shape of a book contained a well-worn bible. I went with my friend Sarah on Friday to a spot in CDN that has been producing for months. While we were looking through the bags a woman came out and aggressively asked us what we were doing. She accused us of making a mess but it was in fact someone else – I think a can picker had tore a hole in a bag earlier in the day. Regardless, Sarah did some smooth talking, diffused the situation and fostered a working if tense relationship with the woman. 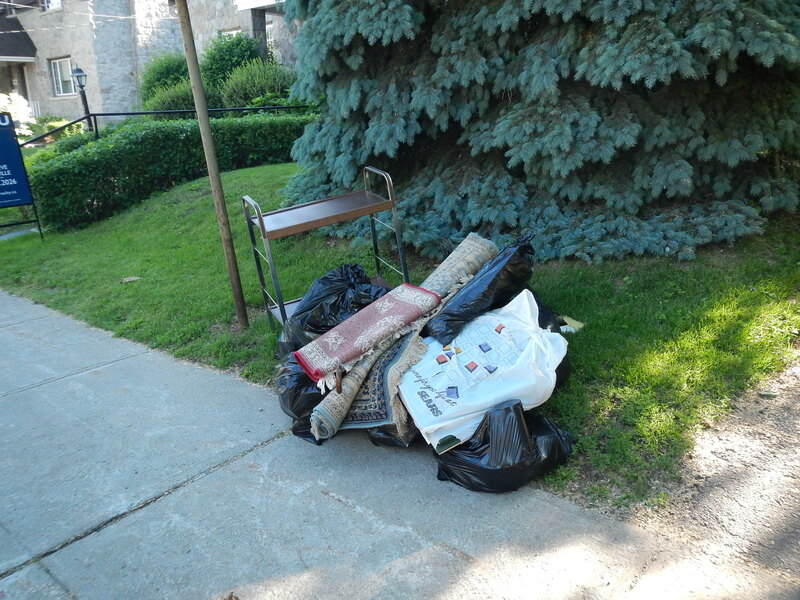 She ended up offering us two garbage bags full of stuff on the condition that we took them as they were. In the end we saved about four bags from the landfill. For her efforts Sarah received a bunch of kitchen stuff, most notably a decent set of silverware and a working food processor. She was pumped. I left what neither of us wanted in a box on the curb but kept a lot of nicer, yard saleable trinkets. 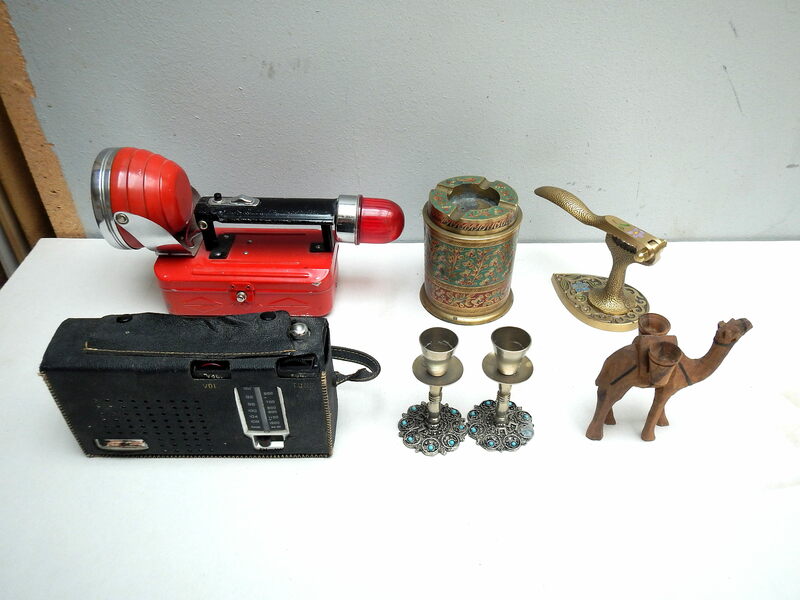 I could have had a decent yard sale with all the stuff we found – the items in the picture above are just a few of many. 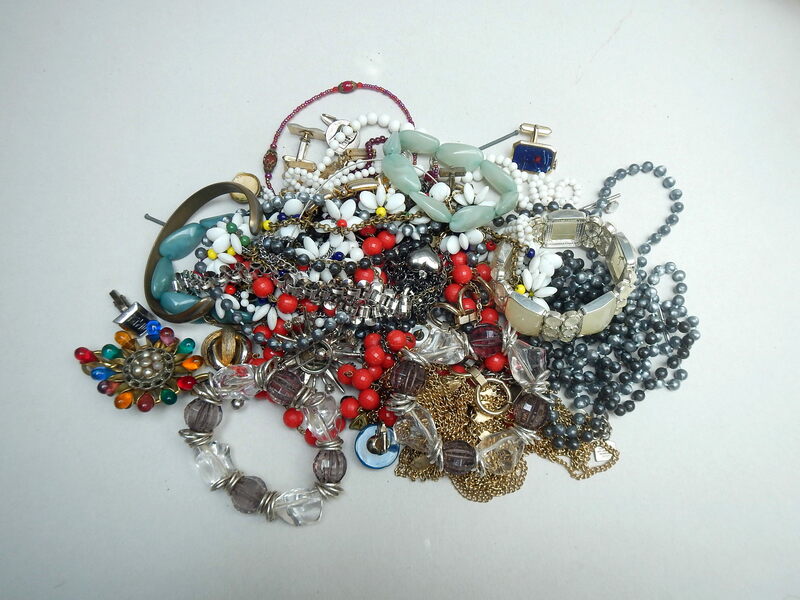 There was a plastic shopping bag full of vintage, if not particularly valuable costume jewellery. Jewellery is always a great seller. 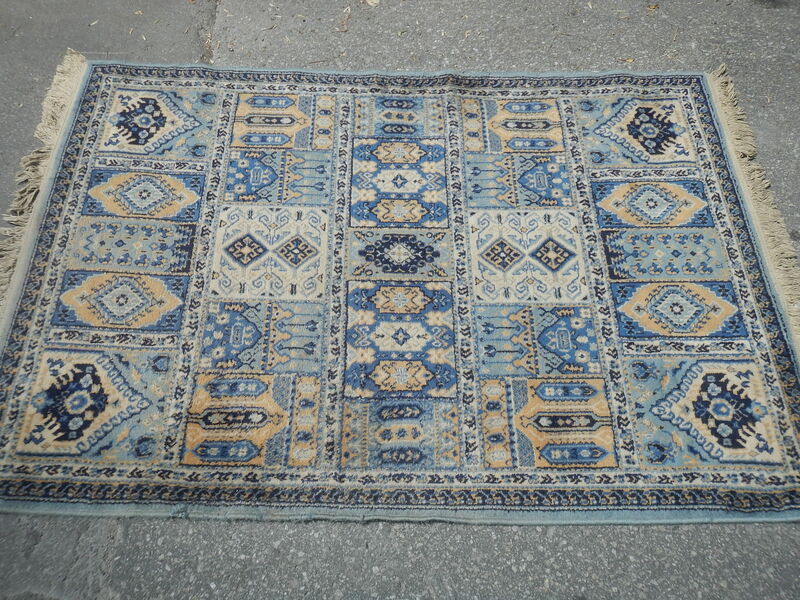 I also brought home a nice little rug. I’ve been looking for one for a while now, though it remains to be seen if it matches my current room. It’s hard to find good, bedbug free rugs so this is a nice get regardless. I think it’ll look great after a go-over with my friend’s carpet shampooer. -Sterling silver pillbox: to a reader for 60$. I posted this just a few weeks ago and someone emailed me right away to buy it. -Silver sports “medals” from pre-war Germany: Ebay for 90$. 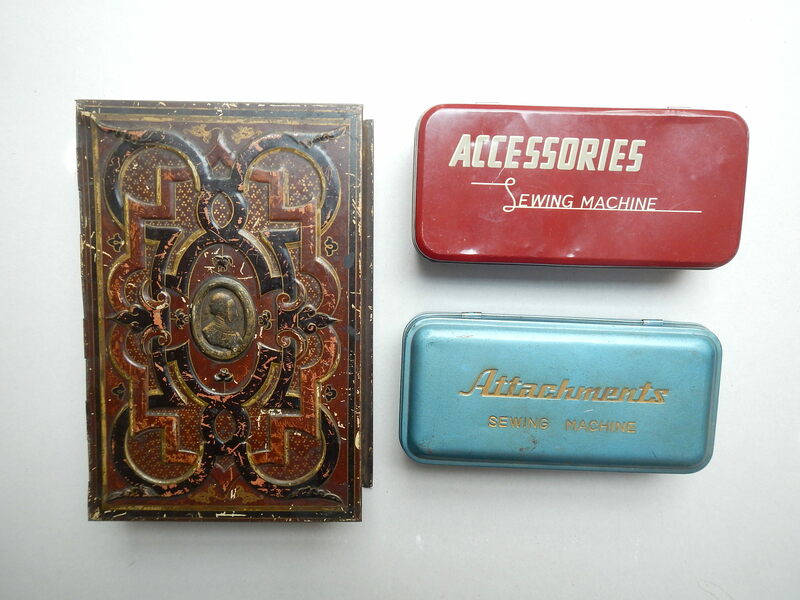 I found these alongside the Nazi German passport. I did some research and found that they were made from re-purposed silver coins. I’ve already made nearly 400$ from this spot alone – I sold that 1824 Jewish prayer book for 150$, the freak show signatures for 154$ and these medals for 90$. -Tea cup and miniature Eiffel Tower: to a reader for 3$. They told me to keep the change on a 20. Thanks! -Mr Fuji action figure: Ebay for 10$. I’ve had this since September and am glad to see it go. Total: 180$, 990$ since May 18. A decent week if unspectacular week for sales. I need to have a yard sale soon, hopefully this weekend. I’ve come up empty so far this week but hopefully tomorrow’s run through TMR will provide some nice finds. As always I’ll let you know. that small rug looks like it might be an antique/old prayer rug. some of those can be valuable (HUGE)..
hope you can find someone to let you know. Nice rug. I think it’ll fit into your eclectically-furnished room just fine. I wish I were there to sort through that jewellery with you. Perhaps sometime down the road, you’ll chance upon, or be able to create a “regular” job that’s a perfect balance for you. Your problems with ‘turning off’ are just standard problems for the self-employed. This is a regular job. Maybe not ‘normal’ but who wants to be that! I would agree with the above comment about self-employed people having a problem turning off. I would also say that life really is a progression, for those of us who are not ‘type A’ personalities. Over the years I have figured out how to become better organized with everything. I used to feel that I had to clean every kitchen cabinet at once and then I figured out that I could just wipe down a few at a time. Silly things like that. It sounds like you bite off big chunks of ‘things to do’, and that itself can be overwhelming. Just keep going along, and you will figure it all out. been giving your post today, some thought. truly, I think you need to find a way to “combine” your current occupation with something which makes more money. in the past year or so, I have read of many who have taken something they currently do, often not for a lot of money, and made “Instructional You Tube Videos”, which can apparently add up to significant income. Maybe that would work? As, I say, been giving this some thought today. Love what you do/find it interesting. It is useful and valuable to society (re using instead of garbage dump/ making money/etc). 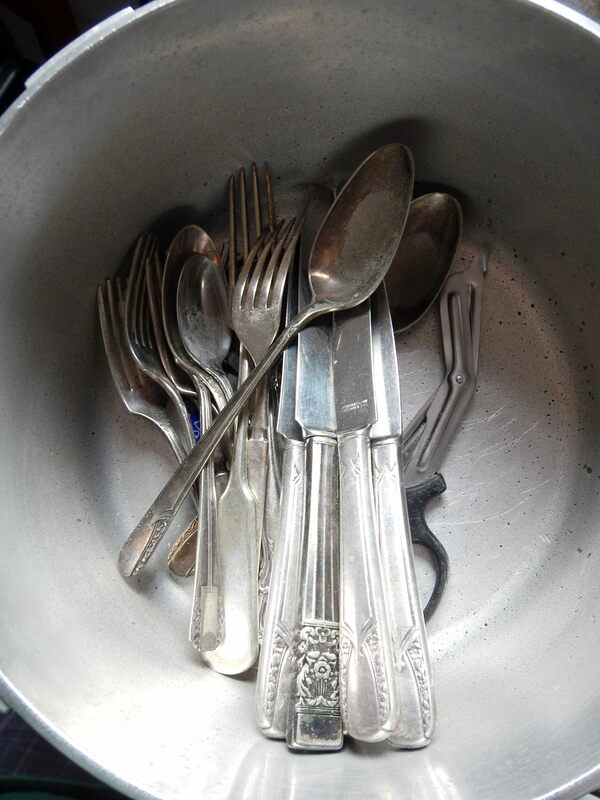 As well, it promotes good values…(don’t just throw things out…etc). Keep thinking it would be a shame if someone like you, who is good at this, was lost to this activity. So, here are my current suggestions to possibly make extra money off of what you currently do…..
***Make life a tad easier for yourself…if not entire garages, print up some small cards/adverts,and distribute offering to “rehome” any goods folks are tossing..Distribute to areas where older folks live/you see signs of folks moving/etc etc. I think you’d be a whiz at the video thing, you have a nice writing manner, and I suspect that aspect would carry over to video. I have no idea how to monetize those you tube videos, but have read quite a few articles on folks who made a fair bit of money that way. Just try being a working mother! Your finds are very interesting; amazing really, and your blog is unique, and so open. Your blog is amazing! You have such an eye! Love love love! 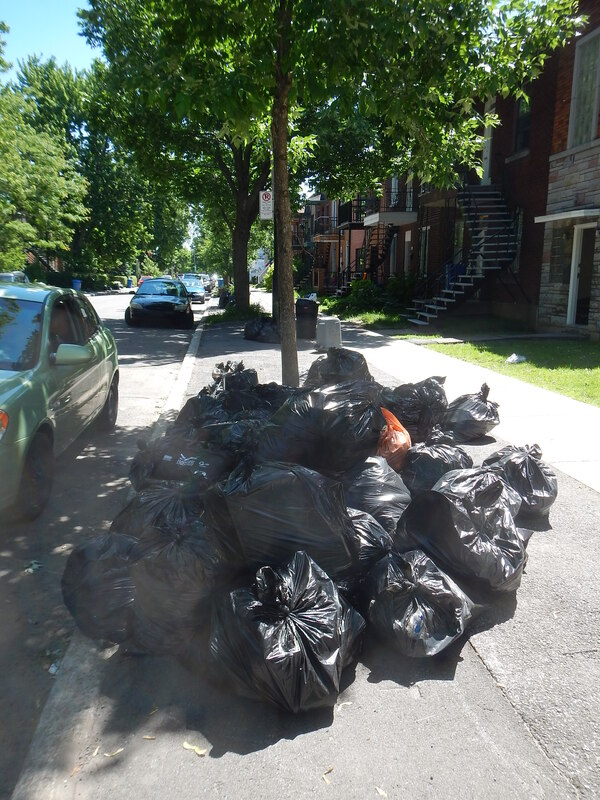 I live right in one corner of NDG.I am looking for places to dumpster-dive here.A lot of supermarkets here put locks on their dumpsters to prevent us students from dumpster-diving.I checked the dumpsters in the back of four supermarkets and came to this conclusion.Food waste is shameful. Maybe try some smaller stores, like vegetable stores (though none in NDG come to mind). A smaller store might not have the money for a locked dumpster. When there was a Laura Secord in Westmount, I remember a big bag of cashews getting dumped, I should have tried to look behind the store for that bag. You can’t live on bread alone, but bakeries seem to be a good place. They won’t be ready for a while, but a few weeks ago the NDG Food Depot had a big planting session, and the planters were along Sherbrooke street, as I saw on the weekend. That project is about “wild food” for passersby to eat. A lot of people don’t want to share where they find things. They either worry that the attention will cause locked dumpsters, or the added traffic will make a mess, or that people kind of playing at it will scoop up the good stuff. Abbie Hoffman once got flack for publicizing where to get food in New York City, some groups had been relying on those sources, and suddenly some who likely didn’t need it went after the food. Most of the stories in old media is about food, and it’s not the “poor people” who get the stories, but people who simply don’t like to see the waste. They probably are doing good, but I’m not always sure they are aware that others might be in more need. That said, you might contact the NDG Food Depot, which has been trying to be more than a “food bank”. They might have some sources that they don’t want to publicize, though hopefully they have already approached various stores and tried to get access to the discards. Of course, right now may be a good time to look, since people moving may decide it’s time to get rid of those cans of food. Certainly when McGill lets out, there often is food just waiting on the sidewalk. As for waste, it’s complicated. Any business is in business to make some money, and if they give things away, they don’t want it to conflict with what they sell. There was a time when one could get various bits of electronic surplus, so long as you signed a form saying it was to be used for hobby purposes and wouldn’t be resold. I doubt most stores like to see tossed food, but if they just leave it, how do they know it won’t go to people who were about to spend money for that food at the store? And of course, most food wastage is about fresh produce. That gets complicated, since it often has to travel quite a bit, so may get picked too early, and the waste is part of the cost of the item for the customer. The least waste seems to come when things are frozen close to the farm, little suffers before the freezing, and frozen vegetables and fruit last longer than fresh, with only minimal loss of food value when frozen. Same with canned goods, though more nutrient gets lost that way. But I suspect then there’s less canned goods that gets tossed, simply because it stays “fresh” and certainly has no blemishes until it actually does go bad. I once sprouted some soybeans (and sprouting is a way to get more value from things than cooking) and planted a few of the sprouts in some earth. And I actually grew a few pods of soybeans as a result. But that shows the scale, it would take quite a bit of space, and effort, for me to actually grow all the soybeans I actually eat. That sort of thing is good so people can see what’s behind the food they eat, but it also shows the work needed. There was a period 30 years ago when I made tofu for a couple of years, and I gave it up, a lot of work (especially cleaning up the sticky soymilk afterwards) for a relatively measly amount of tofu each time I made it. That was stretching things, though it becomes easier if one is willing to make a large quantity. But it showed me the value of buying tofu, while other things I can put the energy into since they are easier to make. Please go to different neighborhoods to scavenge the trash of JUly 1st,Moving day.A lot of scavengers already cover Mile End,The student ghetto,downtown,the Plateau ,Rosemont,Villeray and Park Extension.You should go to other areas neglected by scavengers—areas with many apartment buildings but few houses.Houses do not change hands much on July 1st .Hence avoid Westmount and focus more on apartment-dense parts of NDG,Verdun,St.Henri,LaChine,Ahuntsic,parts of Ville St.Laurent,etc.Try to avoid areas where too many scavengers do the rounds. (Upper and MIddle Westmount are mostly full of houses and expernsive townhouse complexes.Lower Westmount does have a lot of apartment buildings however).Good luck. you probably know all this, however, thought there might be some points in this article to consider. You definitely have to watch out for these things but a trained eye can identify infested pieces. I’ve done a lot of research myself and know the signs and where to find them. I’d like to make a Youtube video at some point showing people how to avoid them. I suspected (as you’ve mentioned) you were knowledgeable, however, thought I’d pass it on. the you tube idea for this, avoiding bedbugs, is a good one too. What I found interesting about that article, or an adjacent article, was that people don’t always bother taking things out to the sidewalk, they just leave things in the apartment when they move out. So the landlord is obligated to keep the items for something like six months, to make sure they rally were abandoned. It made me think of your story of the bag of jewelry and the cops, applying one law they knew to something different. The article even said that many times, the landlord doesn’t know where the tenant moved to. But if the stuff is left in the apartment, it’s not there in the garbage, and likely the landlord will try to sell it after all that fuss. That said, I found a 2-way radio yesterday, in front of someone’s house on St. Urbain. I thought when you found that one last year, it would be a one time find, but I found one too. I don’t expect to find another one, though I’m sure I’ll be hopeful. Another place left an open suitcase of CDs and a few DVDs. I found some I wanted, but as I was poking in another box, someone closed up the suticase and walked off with it, I assume to sell the CDs. If they were interested int he CDs, they’d be sorting through them, like I did and the woman who was there ahead of me. I found some useful cables and adapters, and some neat things that I’ll likely never use, like an audio mixer. And someone left a 1960 set of Encyclopedia Britannica in the McGill Ghetoo; I didn’t check to see if all the volumes were tehre, but if nobody found them they are gone, since garbage trucks came yesterday afternoon. Friday morning is garbage and recycling pickup day in Ville Emard and Cote St.Paul.Last Friday morning I was in Verdun and Cote St.Paul.On De Seve street ,Emard street and Desmarchais street in Cote St.Paul,I saw a lot of great furniture,small knicknacks and tons of beer bottles and soft drink cans discarded in the trash.It was 11 o’clock in the morning,the garbage and recycling trucks had not passed yet on these streets.Yet it looked like noone had scavenged for furniture,beer bottles and cans on these streets.I also saw a beautiful rotating CD rack on Du Seve street in the garbage;I took it and put it in a more visible location.I hope someone and not the garbage truck.I hope more people will scavenge in this part of Cote St.Paul between Laurendeau and Drake street(near Jolicoeur metro).I see many people scavenging in St.Henri,but fewer in this part of Cote St.Paul and Ville Emard.Please check out De Seve,Desmarchais,Emard streets,etc in Cote St.Paul on Friday mornings.